Last month, we introduced you to #EverythingHappensInTheKitchen and this month, we’re taking over EKD designer, Melissa Fitzgerald’s kitchen. 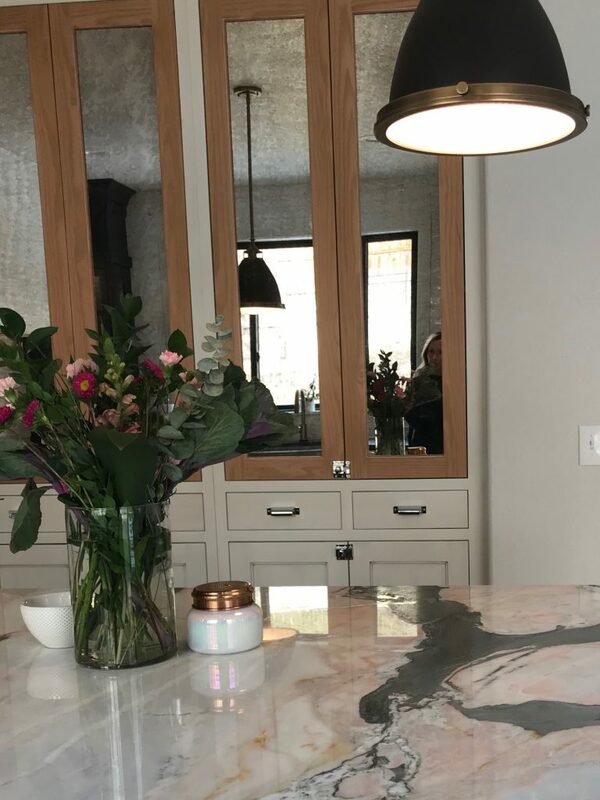 Fortunately, Melissa was willing to let us crash into her home and dissect her beautiful kitchen, chat about the process of a designer designing her own kitchen, and every little thing that happens in her kitchen. 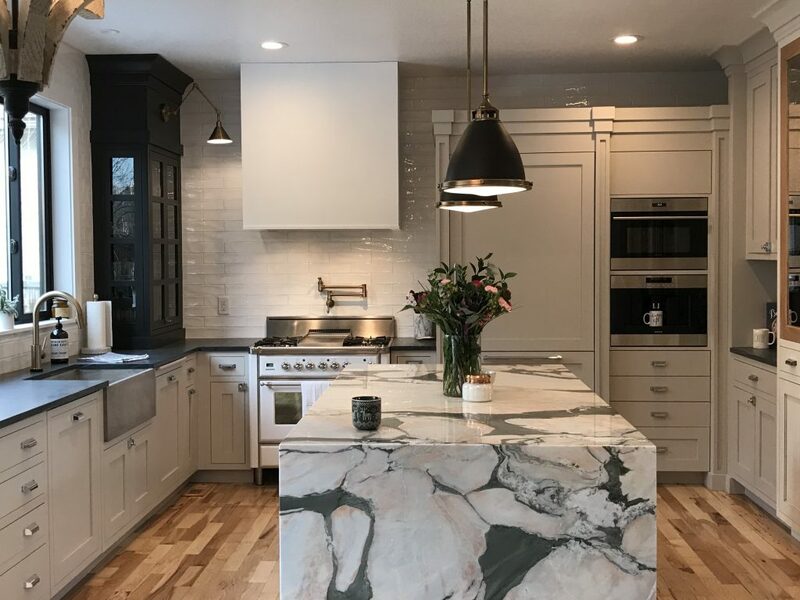 Melissa describes her kitchen as simple, yet textured and includes a concrete sink, a drywall-wrapped hood, and a stunning waterfall island. As a mother of two toddlers, one of the most important elements for Melissa was the island. Having an island where everyone could sit and also have space to move around behind was critical. 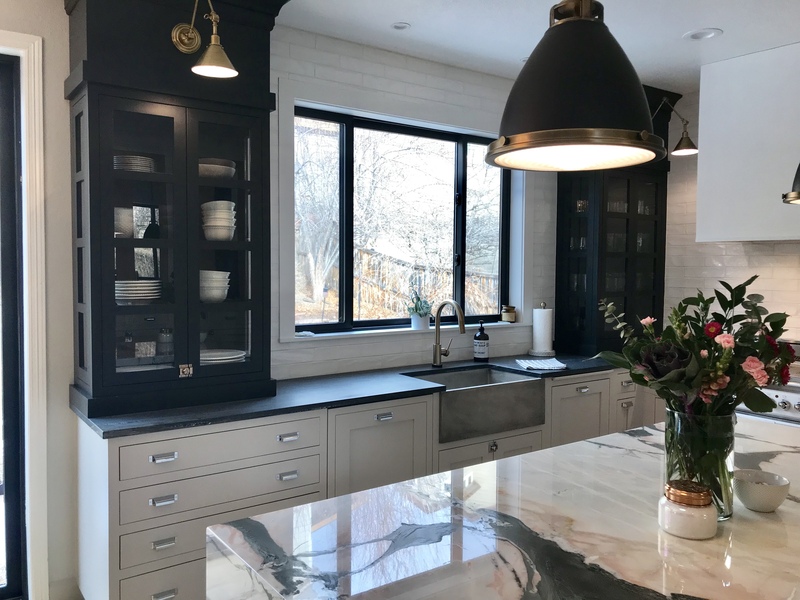 To help make a large island possible, Melissa designed her cabinetry to be 18” deep and added antiqued mirror center panels to give more dimension to the space and make it feel a little larger. One of the things that makes Melissa’s kitchen a perfect combination of styles is the molding – and we totally agree. 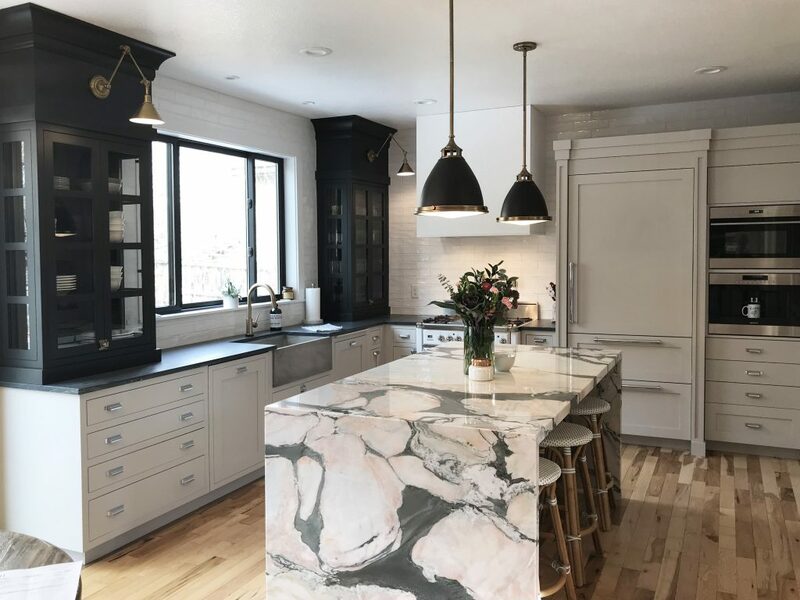 There are different styles and heights of crown molding through the kitchen, which balance perfectly with black and glass panel wall cabinets adorned with brass sconces framing the window. Notable mentions included the USB docking drawer in the island and adding paneling to the refrigerator and dishwasher. 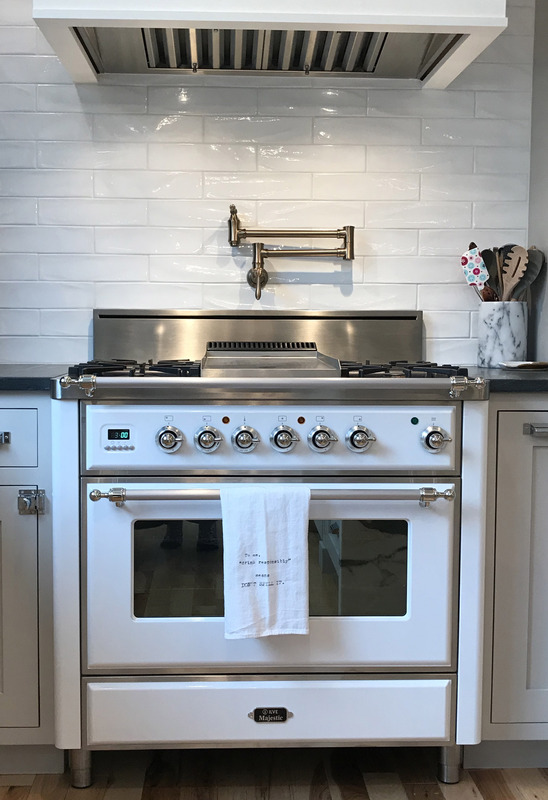 Previously, the appliances were stainless steel – not having to worry about little finger prints has been nothing short of a huge relief! And finally – what is Melissa’s favorite memory in her newly designed kitchen space? Baking Christmas cookies. The large island was definitely designed with a purpose. Being able to roll out two batches of cookie dough and let the kiddos go at it with their cookie cutters to help makes cookies for preschool. That’s what happens in Melissa’s kitchen. Not to mention the adorable spatulas that are the perfect pop of color with the Italian ILVE range. 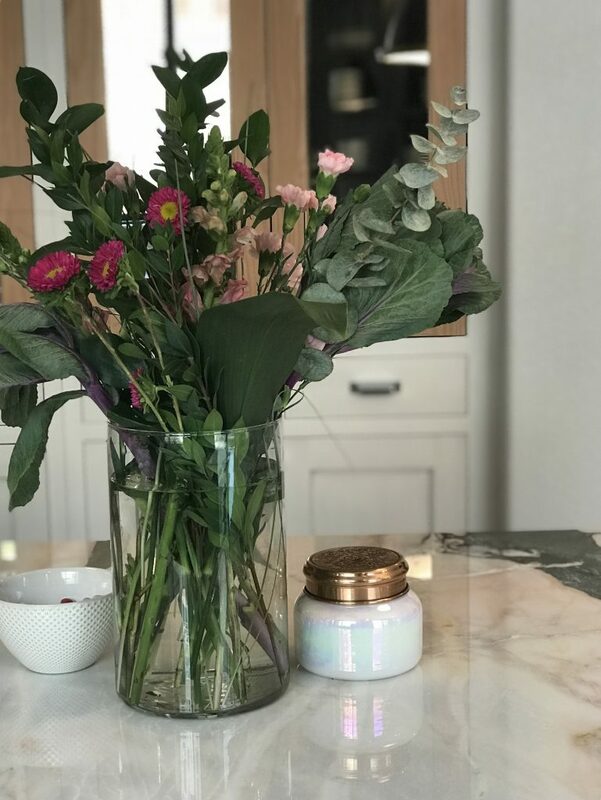 Thanks for joining us in Melissa’s kitchen and make sure you subscribe to EKD’s newsletter, follow us on Facebook and Instagram (#everythinghappensinthekitchen) and send us your own images of what happens in YOUR kitchen!